At Blunston Dental Group in Airdrie, Alberta, we provide treatment for both children and adults experiencing sleep breathing disorders such as sleep apnea. Are you tired of waking up feeling tired? Do you snore, or wake up gasping or choking for air? These are just a few of the symptoms you may experience if you suffer from sleep apnea, airway resistance and snoring. Sleep apnea occurs when you have short pauses in your breathing while you sleep. Obstructive sleep apnea is when your airway collapses or becomes blocked. The causes of sleep apnea vary. If you think you have sleep apnea, see a medical physician for diagnosis. Can children be at risk for sleep apnea? In some cases, children with enlarged tonsils or adenoids may experience symptoms of sleep apnea. If you think your child has sleep apnea, see a medical physician for diagnosis. What do I do if me or my child is diagnosed with sleep apnea? If recommended to a dental professional, book a consultation with Dr. Blunston to see if a dental device may help with your diagnosed condition. 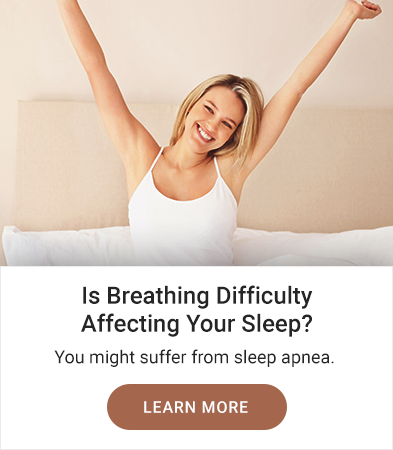 If you or your child experience trouble breathing leading to issues with sleep, ask us about the Buteyko Breathing technique.